Programs | Youth Sailing Foundation of the Palm Beaches inc.
A traditional group program intended to introduce participants to the marine environment, water safety, basic principals of sailing & boat handling, physical activity in an outdoor setting. 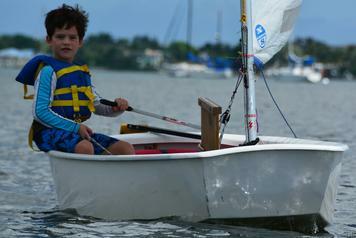 Children are paired with coaches and experienced sailors sailing in medium sized dinghies. Typically a 1 week program with 1/2 day sessions. Customized programs can be designed to accommodate special needs children or focus on specific developmental objectives. Learn To Sail is intended to train Junior Sailors to skipper their own sailing dinghy in calm to moderate weather conditions under supervision. Sailors gain a better understanding of wind, marine conditions, sailing equipment and rigging, points of sail, rules of the road, navigating a simple course, and capsize & recovery. Basic sailing abilities can be achieved after 1 week of full day sessions, but Sailor's confidence & proficiency increases greatly in subsequent weeks. There is an incredible range of competitive sailing opportunities for children ages 8 to 18. 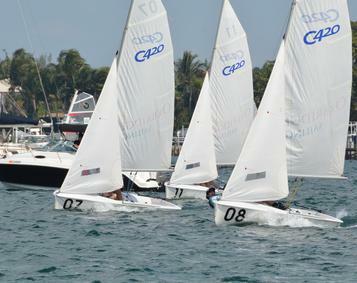 Most young sailors begin in the small Optimist dinghy and enjoy sailing in local regattas or traveling around the state of Florida. 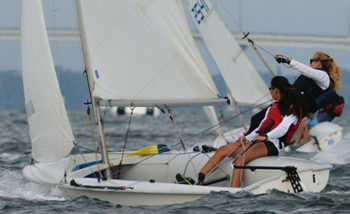 Sailors aged 14-18 may sail in the single handed Laser or the 2 person 420 dinghy used in High School and College sailing programs. The most talented youth sailors travel to National events with hopes of representing the US in international sailing regattas. Training focuses on advanced tuning & rigging, racing rules of sailing, perfecting sailing techniques in a variety of conditions, tactics & strategies, physical fitness & nutrition, and focus & concentration for extended periods of time. Competitive High School sailing is organized under Interscholastic Sailing Association (ISSA) rules. Teams race in Collegiate 420 two person dinghies (main and jib only). High School teams typical practice 3 days per week during Fall and Spring race seasons. A Regional Regatta calendar provides opportunities for teams to compete and earn 'Points' to qualify for invitational and championship events. Simple one day regattas are run to provide many races on a quick & short course. Teams typical rotate thru a fleet of boats provided by event host to ensure fair competition. College sailing follows a similar format. Keelboat sailing provides a critical generational link between young sailors and our seasoned veterans of the sailing community. Whether racing or offshore cruising, this a great opportunity for young sailors to solidify their knowledge & skills gained in small boats, as well as develop communication and team work skills with sailors of different ages and backgrounds. 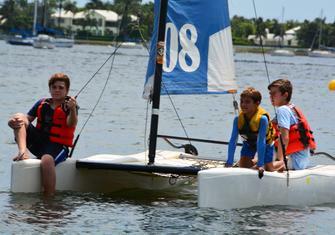 ​We have been fortunate to have members from PBSC Youth Sailing Team invited to sail in local keelboat regattas. It has been an extremely positive experience. Obtaining a keelboat for dedicated youth training/racing will be a priority. 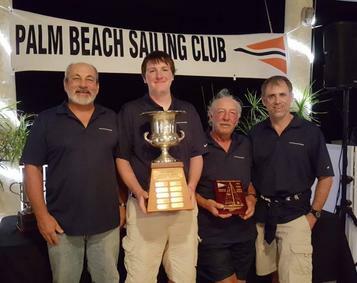 ​Junior Sailor Joseph Murphy (with trophy) and PBSC Sailing Director Don Lasky (with plaque) at awards ceremony for 2015 Fred Thomas Regatta. Joseph was invited to crew on winning J30.